You can save â‚¬250 on a brand new 24″ Apple iMac. By not buying from the Apple store, funnily enough. While I love the Apple store online, and enjoy walking around the physical properties as well, you can’t argue with a saving of â‚¬250. In January of this year I told myself that by the end of the year I would add an iMac to the family. I’m looking for something to handle my workload and free up the MacBook Pro for home use. After saving a few pennies I figured I would go for the 24″ iMac. Yes, one could stop at the 20″ model but I’d set my mind on the 24″ 2.8Ghz model, retailing on the Irish Apple Store at â‚¬1599 or â‚¬1316 ex VAT. I loaded up the cart, hovered, hovered, hovered, and walked away. Coming back, I said I’d try Dabs for the craic to see if they sell Apple goodies, which they do. 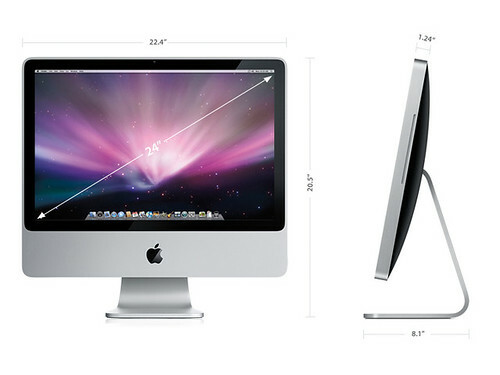 Low and behold on Dabs4Work.ie they have the same 24″ iMac, brand spanking new, at â‚¬1065 ex VAT. Like apple, they also offer same-day / 24-hour dispatch. At a saving to me of â‚¬250-odd Euro. After a slight delay in trying to verify the address of my office, everything is on the way. The way the Euro vs Pound is working now, it certainly makes more sense to buy from Dabs as opposed to Apple. Case in point (as highlighted on Twitter yesterday) – you can buy an Apple iPod Touch (8Gb) on the Irish Apple Store for â‚¬219. The same piece of hardware is Â£165 on the UK Apple Store, now the equivalent of â‚¬175 (with the Euro trading at STG 0.9411 at time of writing). If you’re buying Apple this Christmas, at least for the moment, take the time to shop around online. A â‚¬250 would pretty much pay the tax on my van for 12 months, well worth it.